Conference DIY Anvil Winner. 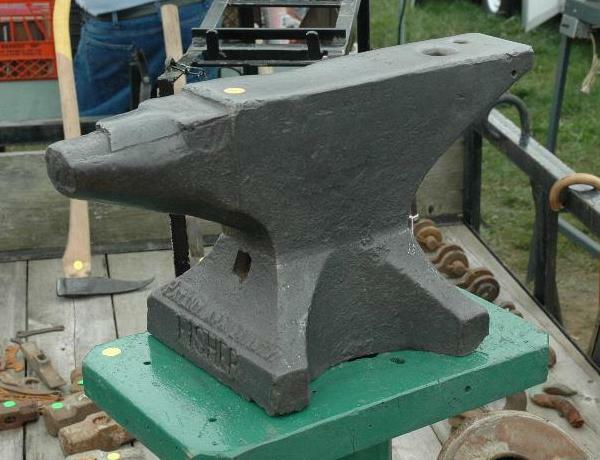 . . (my vote - no contest) Old Fisher-Norris "Eagle" Anvil that has seen much better days. . .
We have done a couple of 'all historic' smelts - which included period clothing. Wool and linen are actually pretty safe. Now, to be fair, my rule in museum work is 'history stops when safety starts'. So I do wear modern safety boots and a full face shield plus those didydium glassess. Leather is leather however, and my wife also made me up a special pair of linen pants that are tripple thick at the front. Before I pulled the bloom I simply walked into the pond to soak all my clothes (Maybe not the smartest idea, considering steam generation, but it did keep me from burning up.) And yes - I did put those pants on fire too! I was wearing the same leather apron and heavy leather gloves. (Rather than the foundry gloves you saw me use on Saturday). For the face I think you could use something like a snow mask - a large piece of hard leather with a couple of slits in it for the eyes. That would certainly work - and of course historicaly people were not as concerned with workplace safety as we are today. The wood handled tools are a guess on historic types - rather than a specific requirement. In the past iron was expensive. There are absolutely NO artifact prototypes to guide us, and admittedly I have a pretty full selection of different probes and rakes. The use of the long wooden handles is an attempt to show how conservative the Norse would likely be in utilizing iron. All the tools are guesswork however! We do want to test out some more tools made of green wood. Both Mike McCarthy (originally from the Farmers Museum in Cooperstown NY) and Michael Nissen (Ribe Viking Centre, Denmark) have done a lot of work with 'sticks' to good result. It has been a long time since I posted a new edition of our NEWS. Life has gotten very busy for me and these pages take a LOT of work. Here it is Thursday after the weekend event and I am still working on the NEWS making corrections. There are always corrections. . . Over 200 photos were sorted through, edited, some even having the backgrounds carefully cut out such as for the Jack Brubaker article. There is also one drawing of explanation and there could have been more. It has also been a couple years since I went to a SOFA (Southern Ohio Forge and Anvil) Quadstate conference. I have photos from 2005 as well as BigBLU's event and BAM this year. . . I left a gap in the numbering of editions for those and other articles that have gotten brushed to the side. Most years when I go to SOFA I concentrate on the tools and always buy something. This year my purchasing was limited to a NEW BLU hammer for my student Sandy. This year I tried to cover several of the demos but did not cover all. I could have spent more time hustling from one to the other but the fact is I'm getting older and much more out of shape. . . I also could have spent some late nights smoozing but I am not much of a party person. The 2008 SOFA conference was as good as ever. Although I did not show allll the tools there were many to be had. 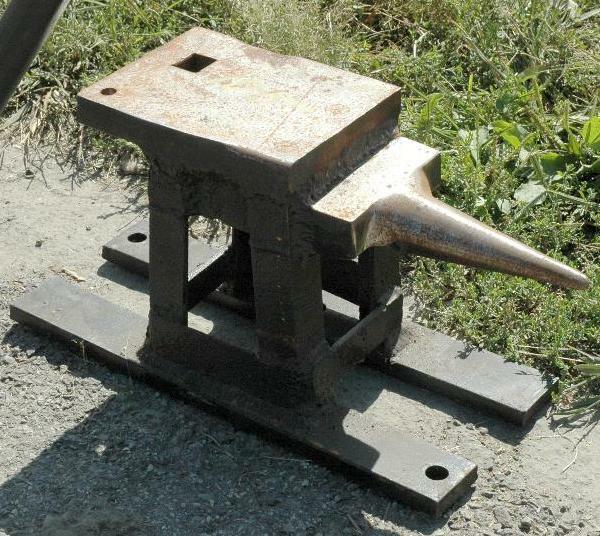 Anvils, stakes and hammers of many types. I think the entire camping area was full and the attendance was over 850. This was more than the last two ABANA conferences. This Edition is only the third new format for the NEWS. In the past all our pages fit a 640 wide monitor. With this issue and the 41st fill in we have gone to a conservative 800 pixel wide format. According to web statistics less than 1% still use those old monitors and only 7% are limited to 800x600 the majority are over 1024x. We have also added the ubiquitous google click through ads with the wider format. What can I say, they help pay the bills. We have also gone to larger images. While this works with larger monitors there are still many folks out there with dialup conections. So, while we have larger images the total page lengths will be kept short to reduce slow painful loading of images. I would like to promise to do better. . . but one thing I have learned is to TRY to not make promisses you may not keep. I have too many projects backed up including the overall rework of anvilfire.com PLUS many new features (soon), a dozen book reviews, two power hammers in progress, TAXES. . landscaping for Sheri, digitizing for Sheri, lessons for Sandra, a bar twister from a huge gearbox, finish moving my shop, finish setting up the new shop, a NEW blacksmithing web project. . .
. . Fire at Peter Buchanan's . .